“I was recently married and my wife Lisa and I took our honeymoon along the east coast of the United States traveling from New York to Maine and back again with various stops along the way. Having a wife who is also a gifted photographer (not to mention an amazing woman) we spent our time together both as tourists and as seekers of that next great image. This was my first time visiting New York and since the beginning of my career as a photographer I have been equally intrigued by both landscape & cityscape photography. There is just something about all the lights of a big city shining after dark that draws me in and captivates my imagination and creativity. I also have a fond appreciation of decorative bridges so a stop by the Brooklyn Bridge was a must. When we reached the bridge, we found it under construction and partially covered by plywood and fabric. I searched for options to shoot around the construction but it was just not possible for what I was hoping for. We took a walk down the waterfront and came to a spot that we had seen in photographs that we knew we wanted to capture as well. I had been shooting at the waters edge while Lisa had been creating images up above along a break wall of large boulders. When I joined her up above I saw the reflections of the city lights that I had been missing down below. 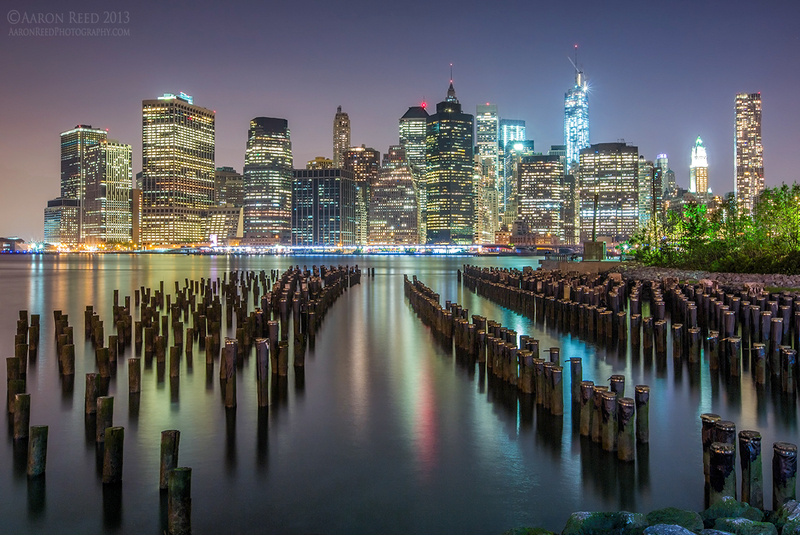 The combination of the wooden pilings and the beautiful reflected light in the water below along with the bright lights of the Big Apple above made for a striking image with great contrast between old and new. I choose a smaller aperture of f/16 to achieve a technically sharp image from front to back without issues of diffraction coming into play. I was also hoping to catch some well defined starbursts from the lights across the city and was pleased to see one perfectly placed on the nearly completed One World Trade Center. Aaron Reed is a fine art photographer based in Seattle, WA. He also teaches Exposure Northwest Photography Workshops all over the Pacific Northwest United States. This is one of my favorite spots to shoot when in NYC, and one of the reasons I like staying the Battery. Absolutely beautiful shot. Thank you sir, and thank you Really Right Stuff! That’s really a magnificent image, Aaron. I like the way you’ve taken a classic landscape approach using the pilings in the foreground to draw the eye into the image. Great composition and perfectly exposed. Who knew there could be so much color in a night scene? Very well done! I love the way you’ve taken a night shot and brought in the green of the trees on the right border. It gives it a combo effect of day and night. Great image!